Emilio Fernandez, the director of "Maria Candelaria" clearly demonstrates he was a genius. El "Indio" Fernandez elevated the Mexican cinema into an art form thanks to this great 1944 movie that won the best prize at Cannes. "Maria Candelaria" is a collaboration between Mr. Fernandez and Mauricio Magdaleno. The film is beautifully photographed by Gabriel Figueroa, perhaps Mexico's best camera man of all times. The result is a deeply engrossing drama that remains as fresh today, as when it was originally released. Dolores del Rio was a Hollywood star who refused to play stereotypes in any of the films in which she appeared in Hollywood. She was a woman of sophistication and good taste, but at almost 40, the actress realized it was time to reinvent herself, packed her Louis Vuitton trunks and left for her native land. There, she became the absolute queen of anything of quality filmed in Mexico. In a way, it is ironic her best film in Mexico she plays an Indian woman, something she wouldn't have agreed to do for the American cinema. She worked extensively on the screen and in the theater until her death in 1983. In this film she was paired with one of the best actors of Mexico, Pedro Armendariz. The chemistry between them is what holds the drama together. Lorenzo Rafael loves Maria Candelaria, a local girl that is a woman generally hated by the people of Xochimilco. We are given a prologue when the film opens as the painter reveals the canvas that has provoked the furor among the modest people of the area. We are taken in flashbacks to know the story, set in the floating gardens of Xochimilco, that were pristine when the filming took place. We watch as the flower sellers perform a sort of aquatic ballet as they go doing their every day business. One gets to know the story of Maria Candelaria, and her tragic story. 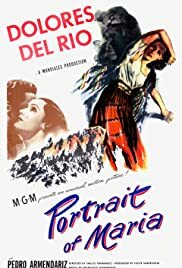 Dolores del Rio, even though she is supposed to play an Indian girl, looks as though she was a great lady in peasant clothes. Ms. del Rio's face had the angles the camera loved. She had one of the best opportunities of her distinguished career in the film. Pedro Armendariz is excellent as Lorenzo Rafael. Mr. Armendariz has great opportunities to show his extensive range playing opposite Ms. del Rio. This is an Emilio Fernandez and Gabriel Figueroa masterpiece!